At Shaw Primary Academy, we see reading as an integral part of our school curriculum that impacts on all learning. We value the importance of being a confident reader and work hard to develop children’s reading skills. We want children to enjoy reading a wide range of different books and be able to talk about books and authors. Phonics is taught discretely from the Foundation Stage through to the end of Key Stage 1 using the Read Write Inc [RWI] scheme. Year 1 pupils take part in the phonics screening in the summer term. Results of the screening are shared with parents at the end of the academic year. Older pupils who require more phonics skills are catered for through RWI intervention programmes. All children are encouraged to read at home every evening either independently or with a sibling or an adult. They take home a reading book from the Oxford Reading Tree scheme and also have the option of choosing a book from their class library. This shared learning will help children to practice their reading skills and develop a lifelong love of reading. The Education Endowment Foundation [EEF] exists to fund, develop and evaluate cost effective and replicable projects which address educational disadvantage. Rooted in reading for pleasure and with systematic phonics at its heart, Oxford Reading Tree's well-loved characters, breadth (over 800 books!) and varied writing styles give children everything they need to become confident readers and it is the reading scheme we use here at Shaw. Every child here at Shaw is given a book from this reading scheme that they can take home and share with you. Once they have read the book they can change it in school for another, working through the reading scheme and moving on to the next book band when ready. The books are available from Reception to year 6 and they are banded with the children moving to the next band when secure with the previous one. The very first books contain only pictures for the children to tell their own stories, moving on to a few words on a page and continuing until they become well established readers and reach the books which are longer chapter books. 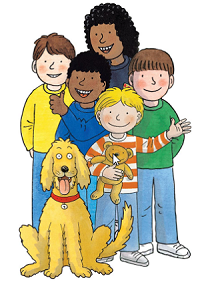 There are a wide range of books in the Oxford Reading Tree scheme catering for all ages and interests including series such as Floppy's phonics, Biff, Chip and Kipper, Traditional Tales, Songbird Phonics, inFact, Story Sparks and Graphic Novels. We have a broad range of these in school with both fiction and non-fiction texts available. You can support your child with their reading and progress by reading their Oxford Reading Tree books daily at home. Encouraging them to read at home will foster their love of reading for pleasure and in turn will support them in making progress in many areas of their learning here in school. Reading is an essential skill to learn and promote and reading as much as you can at home is important. Thank you for your support with this. Don't forget, every book read at home also counts towards a leaf on our reading tree!